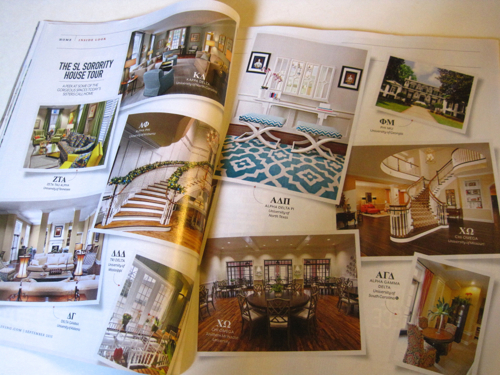 Lately, I've been picking up and placing back on the newsstand a number of fall magazines. I was looking for something with some fall baking inspiration (and the last time I went to the grocery store, the new Tea Time wasn't in yet), but nothing appealed to me. 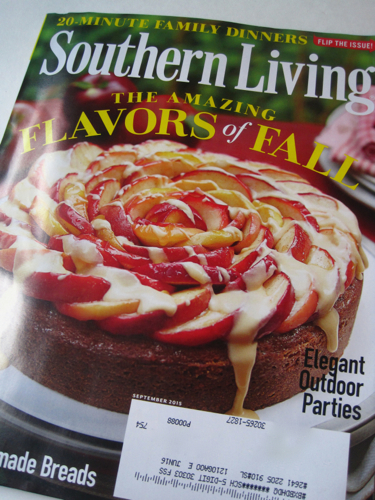 Then, when I caught up on my mail this weekend, I realized the new issue of Southern Living had just the inspiration I was seeking! 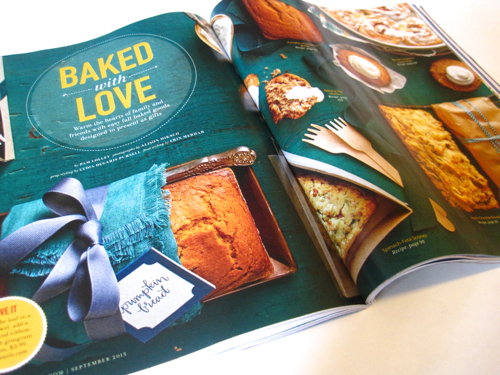 Isn't that Apple Cake on the cover gorgeous? They call it their "No-Peel Apple Cake," and it takes just 20 minutes of preparation, so I want to give this a try. Were any of you in a sorority in college? There's a fun tour of sorority houses in the South, and I was surprised at how elegant they are! My faves were the spaces belonging to Alpha Delta Pi at the University of North Texas and Alpha Phi at the University of Alabama. For the garden lover, there are wonderful spreads on creating outdoor rooms, and for the football-loving garden lover, there's a clever piece on creating container gardens in the color of your favorite team. Also, I should mention that the featured home plan in this issue is from our Coweta town of Senoia, and it's one of the homes featured in AMC's "The Walking Dead." And now, if you'll excuse me, I need to go check my pantry to see what I need to make some great new scones and tea breads! Ruth reached down into the kitchen cabinet for the tin loaf pan, its scratched and darkened metal testifying to years of use. 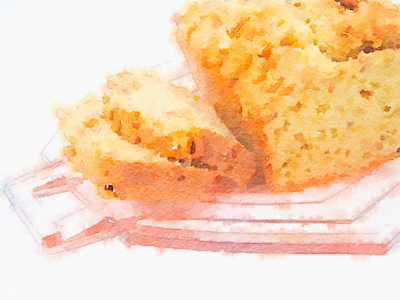 The loaf pan was just where it always was, right-hand side of the shelf, on top of the muffin tins and cookie sheets. As she pulled it out, she paused to massage her hip. Her doctor kept telling her she needed to have a hip replacement soon, but she was content to pop a few Advil and try to live with the pain a little longer. Fortunately, she didn’t have to reach or stoop to gather the flour, sugar, and other staples she needed for baking. 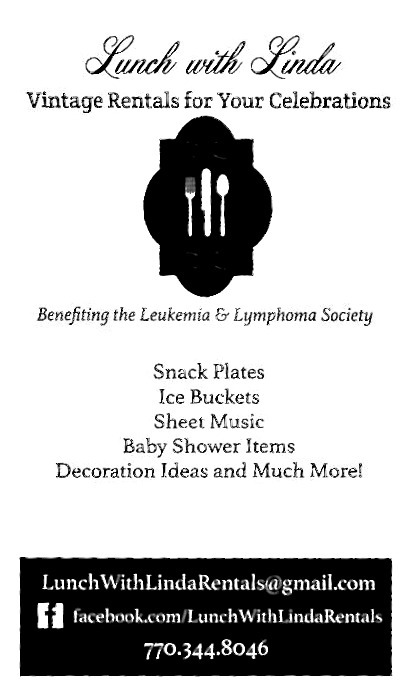 That set of brown Tupperware canisters was one of the best purchases she had ever made. 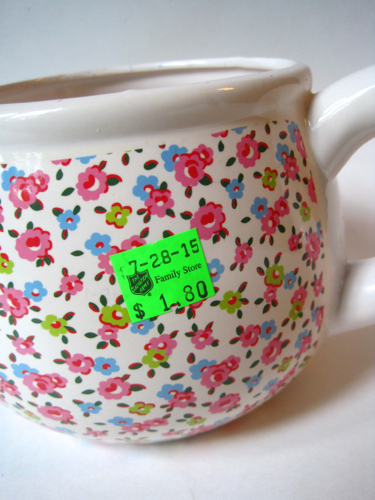 The lids on those canisters still fit tight as a tick, just as sturdy as the day she bought them, and besides, they matched the rooster print of the kitchen wallpaper. Walking slowly over to her small but tidy pantry, Ruth looked on the second shelf and pulled out a jar of Jippy Peanut Butter. Ruth had eaten nothing but Jippy since it first came out in the fifties. It was the only peanut butter her kids would eat, and the “kids” were almost senior citizens. Her son loved the Creamy, but her daughter wouldn’t eat anything but Extra Crunchy. Ruth kept jars of each on hand at all times, just in case the kids stopped by. After she finished sifting and measuring her dry ingredients, she added the peanut butter, eggs, and milk. She greased the pan, poured the batter inside, sprinkled some chopped peanuts on top—after munching a few—and set the timer for one hour. Soon, the rich scent of hot peanuts filled the air. Peanut butter had long been a staple in her home. Her late husband, Bill, had always had a tablespoon of peanut butter—the Creamy—on his toast each morning. Occasionally, Ruth joined him in that, but she preferred the Extra Crunchy. Over the years, she’d made just about every peanut butter dessert imaginable: peanut butter cookies, peanut butter bars, peanut butter balls at Christmas. 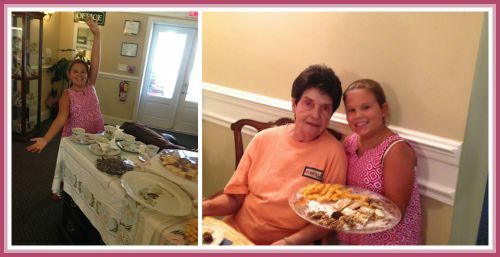 Her chocolate peanut butter pie was always a big hit when she took it to the Senior Center’s monthly birthday parties. That evening, Ruth’s neighbor Eloise was coming over for dessert and tea, so Ruth was baking a favorite treat, her Peanut Butter Tea Loaf. Eloise, who was hard of hearing, loved it, but Ruth had had a devil of a time explaining why it was called a “tea” loaf. “Is there tea in there?” Eloise had asked, hollering as if she thought Ruth was hard of hearing, too. “No, no tea,” Ruth had said. “I know it’s nutty. I said, is there tea in there?” Eloise had asked, louder. Ruth had explained that a tea loaf was just a name and didn’t really mean that much. A true Anglophile, she knew that “tea loaf” usually referred to those English cakes made with dried fruits and served in slices with butter on them, but she didn’t have the patience to try to explain that to Eloise. Once, Ruth had made the mistake of trying to watch one of her entertainment programs while Eloise was there. “Who are all those gals?” Eloise had asked. “They’re the Kardashians,” Ruth replied. Ruth finally learned to keep the TV off when Eloise visited. When the timer sounded, Ruth removed the tea loaf from the oven and let it rest in the pan on a wire rack for ten minutes. When Bill was still alive, he’d always gotten into the baked goods before they cooled, and she’d slapped his hands away many times. She smiled at the memory. If only Bill’s hands were there to reach for a fresh-out-of-the-oven dessert once more. The rooster teakettle on the stovetop was starting to whistle, so Ruth went ahead and prepared her cup of tea. She liked a strong English Breakfast blend at any time of day, and Eloise didn’t have a preference one way or the other. She came for the gossip more than anything. 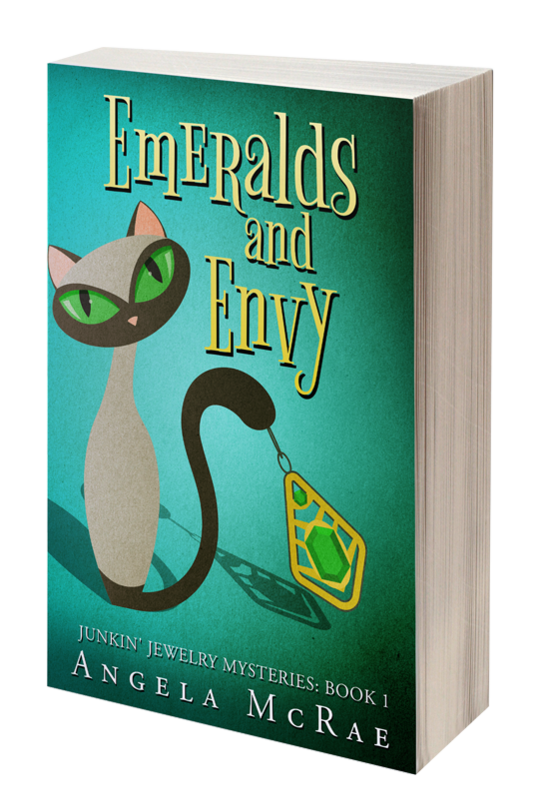 At seven o’clock, Ruth heard a knock at the door and knew it was her friend. “Not a bit,” Ruth said. 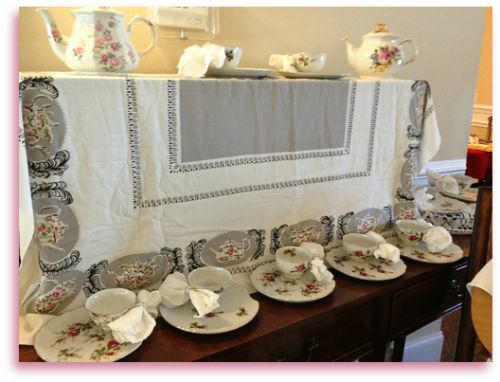 She prepared Eloise’s tea and brought it to the table along with a pink glass plate bearing the sliced tea loaf. “It sure is,” Ruth said. “No, it does not have tea in it,” Ruth said, speaking each word loudly and clearly. Maybe she needed to rethink having Eloise over so often. Ruth shuffled back to the pantry and gathered two lightweight TV trays to set up in the den to hold their food. She turned on the TV just as a familiar young face appeared on the screen. Ruth grinned. “I need a refill. How ’bout you?” Eloise, her eyes glued to the screen, nodded and handed over her teacup. “Give me strength, Lord,” Ruth said. And just for good measure, she reached in the can for a few peanuts before rejoining her friend. It was, after all, much better to eat nuts than to be nuts. Those who've been reading this blog for a while know that I love history, and that fact alone has sent me to the Library of Congress website numerous times in recent months. 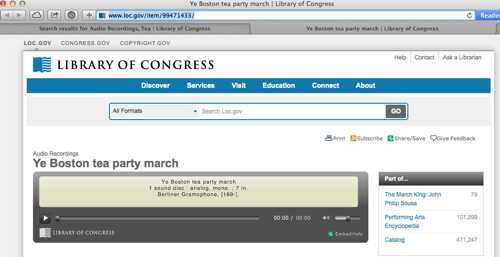 This week's find was the 1890s tune "Ye Boston Tea Party March." The website says this song dates to the 1890s and was performed by Sousa's Band, conducted by Henry Higgens, and composed by Arthur Pryor. Got two minutes? Then click here and click on the arrow in the gray box to listen to "Ye Boston Tea Party March" and put a little spring in your step! 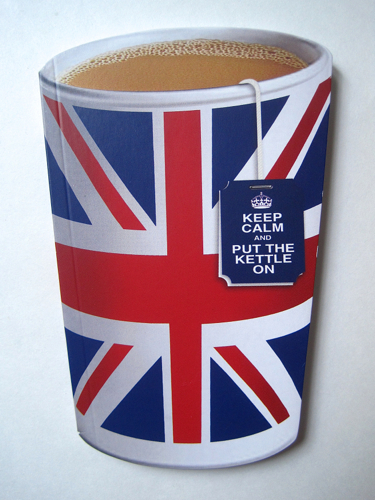 A pocket notebook perfect for tea lovers! 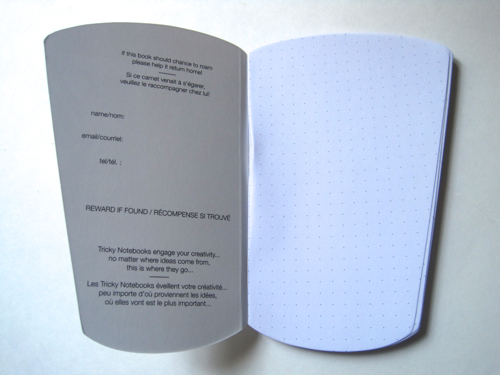 With the little dots on each page, this notebook would be good for sketching as well as scribbling. Although I got mine in North Carolina, you can find these online by clicking here if you're interested. Recently, I learned about an offer of free tea samples from Chi Whole Leaf, and I imagine some of you quickly ordered samples just as I did. I was intrigued by their powdered teas which let you "drink the leaves." 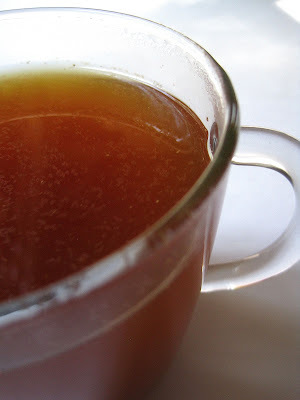 Ginger Chai — Tried 1/4 teaspoon of tea first, but the drink was too weak. Tried 1/2 teaspoon next and it was much better. This tea is made with rooibos, but I must say that it reminds me of that popular "Friendship Tea" mix made with Tang. Green Mint — This flavor, I loved! My only problem with this tea was that I didn't drink it fast enough, so the powder drifted to the bottom of the tea mug, and I ended up getting a swig of a murky, chalky something before I could finish the drink. Floral Herbs — This was my least favorite of the teas. The hibiscus flavor was quite strong and tart, and the rose and jasmine were almost imperceptible. For some reason, this one reminded me of Theraflu! You know how they say "we eat with our eyes first"? Well, I think we drink with our eyes first, too, and I realized that seeing these particles floating around in my teas did not add to my enjoyment of them. The taste of two of these teas was actually pretty good at first sip, but when I tasted some of the tea particles later in the sipping, it was a turnoff, and the tea's consistency is, I'm afraid, a problem for me. 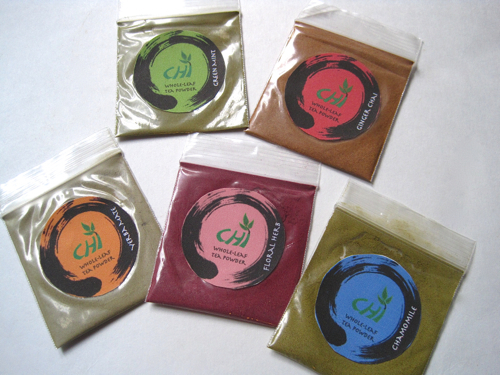 But I'm not through with the teas just yet, because I think these powdered teas might be good to use in cooking! Did any of you order the samples from Chi Whole Leaf? If so, what did you think? 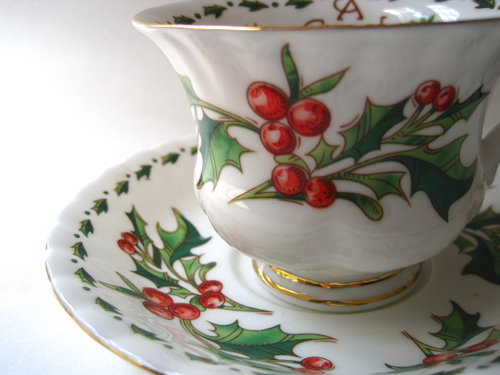 Several years ago, I found the "Cup of Christmas Tea" teapot in a local antique mall, so I was delighted to come upon the matching teacup and saucer the other day at an antique mall in Bremen. The set was $12.99, which I thought was a fair price. I've seen these selling for more than that on eBay, not including shipping, so I think I got a pretty good deal. 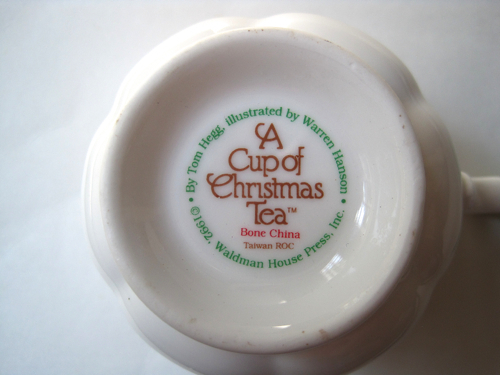 Can you believe that the book "A Cup of Christmas Tea" came out in 1982? It seems like only yesterday I was attending a friend's Christmas tea where she read this book and gave a copy to one lucky guest (not me, although I later purchased a copy for myself). And the book that was "new" back then is now sold in antique stores. Thankfully, so are the teawares I somehow missed out on collecting back in 1992! 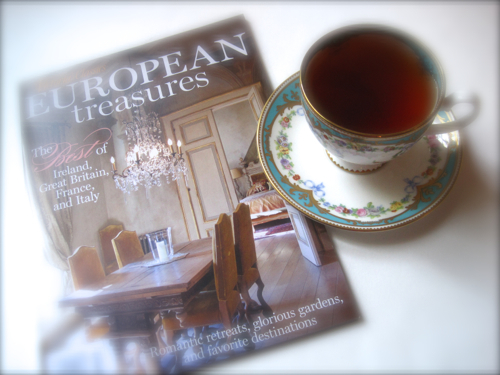 Over the weekend, I set aside an hour and a cup of tea just to pore over a new magazine, European Treasures from Victoria Classics. 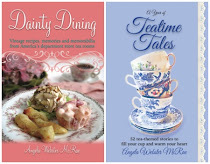 I so enjoyed my armchair travels with this issue that I wanted to tell you of some tea-related discoveries I found within the pages! 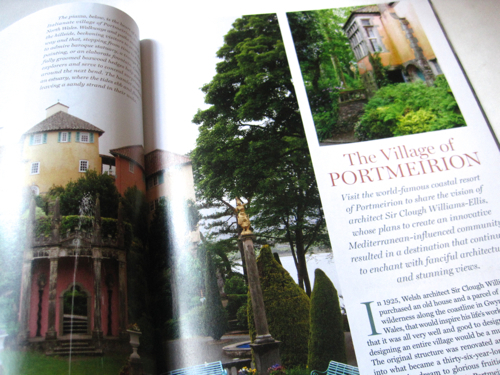 Although I've used Portmeirion teawares for years, I knew nothing of the coastal resort of Portmeirion, an Italianate village in North Wales. Pormeirion founder Susan Williams-Ellis was the daughter of architect Sir Clough Williams-Ellis, who designed the village of Portmeirion. 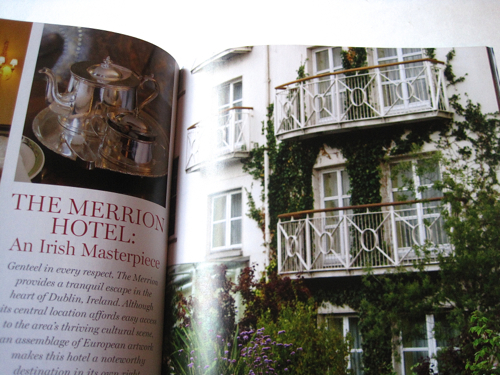 I absolutely adored the photos of the hotel and cottage. Yet another bucket list destination! 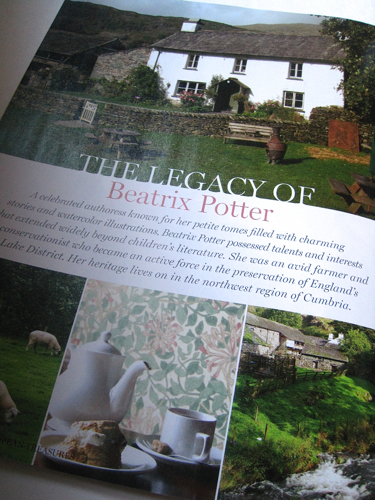 A feature on "The Legacy of Beatrix Potter" made me love her all over again for her generous gift of farmland to the National Trust, and I did not know that a place called Yew Tree Farm was the stand-in for her famous Hill Top farm in the movie "Miss Potter." If you, too, are afflicted with wanderlust, this magazine is a lovely place to lose yourself for an hour or so! I couldn’t wait for Social Studies to end. Just my luck that I had gotten Ms. Bradley for the year. Dang, that woman droned on and on. She last updated her wardrobe in, like, the nineties or something, and she had that big long chin hair that she wouldn’t pluck for some reason. Hannah said that one day, she was going to bring tweezers to class and just go up there and yank that thing out, but I told her that was crazy. The school resource officer would probably arrest Hannah for assault or something, and there I’d be, having to visit my best friend in juvie. To earn extra credit for the year, Hannah and I signed up for community service projects and volunteered to work with the historical society like we did last year. I had figured it would just be a bunch of boring old people sitting around talking about the Civil War, but it wasn’t like that at all—not unless somebody just wanted to talk about the Civil War. That was also how I met Claire Wilson, their party person. Her official title was something like “Community Outreach Coordinator,” but I worked with her last summer and got the scoop. I found out she loved to party, and she wanted to invite me to all their parties—or “community outreach” events—but she said they always had a lot of booze flowing, and it freaked out the grown-ups to have teenagers around. Like we didn’t know they liked their beer and wine. Duh. But that afternoon, Miss Claire wanted me and Hannah to help with an afternoon tea for some girls in the after-school program at one of the elementary schools. Hannah told Ms. Bradley we needed to leave class early to help with the tea. She explained that we would be teaching the girls about Victorian tea etiquette. Brianna Simpson heard that and started saying “Fiddle dee dee” over and over, like we were going to Gone With the Wind tryouts. Idiot. She probably didn’t even know that the Victorian period lasted until 1901, and she probably thought Queen Victoria was a rapper. But I didn’t want to waste time thinking about stupid old Brianna Simpson. Hannah said Brianna was jealous because Joshua Taylor sat by me at lunch today. I told Hannah that was ridiculous. Joshua had lived down the street from me all my life, and our parents were best friends. I hoped he didn’t get mixed up with a skank like Brianna, but I wouldn’t judge him even if he did. If he wanted to go with someone like her, why should I care? When Hannah and I got to the historical society, the first thing we did was get dressed in some hoopskirts and gowns that Miss Claire had ready for us. I got the pink one, and Hannah wore the blue one. We wore big old gaudy hats, too. Little girls loved those. 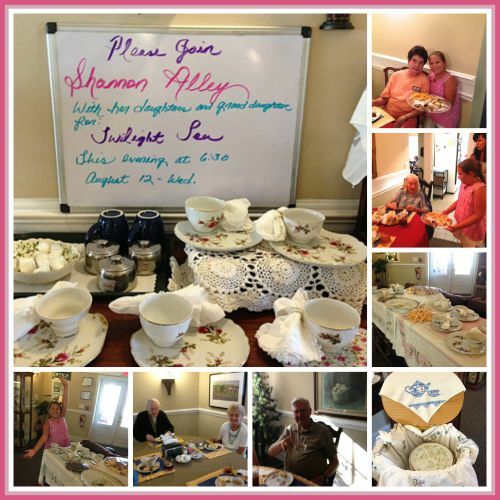 Ten girls were at the tea party, and we decided Hannah would go first and give them a few etiquette tips. Since Hannah had two older sisters and never got to be the boss, I didn’t mind if she got more speaking time than I did. I just had one bratty little brother, and I generally got along with him, except when he kept adding new games to my iPad without asking. As Miss Claire and the other volunteers brought out the tea trays, Hannah told the girls they were supposed to eat sandwiches first, then scones, then sweets. One little girl was already nibbling on a chocolate-covered strawberry, but Hannah and I just grinned at each other. We knew it was bad etiquette to make your guests feel bad when they messed up. When it was my turn, I told the girls not to hold their teacups with their pinkies up. Somebody was always telling little girls to drink tea with their pinkies up, and it drove me crazy. Why did people do that? One little girl said that was a relief because her pinkie was already tired. Once the tea was over, I texted my mom to come pick us up, and Hannah and I changed into jeans and T-shirts. As we dressed in the bathroom, someone knocked. It was Miss Claire asking us to stop by her office before we left. When we got there, Miss Claire had two navy blue gift bags on her desk. Hannah and I were beaming. It was nice to be appreciated. My cell phone pinged to let me know I had a text. It was my mom telling me she’d pulled up out front. “Mom’s here, so we’ve gotta run. Thank you,” I said, holding up my bag as I left. “Yeah, thanks, Miss Claire,” Hannah said. We dropped Hannah off at her mom’s gift shop downtown, and then Mom dropped me by the house before going to buy groceries. I’d had a few cucumber sandwiches and some Earl Grey at the tea party, but I was still hungry. While I warmed up leftover pizza, I opened my gift. Underneath the layers of dark blue tissue was a white box. 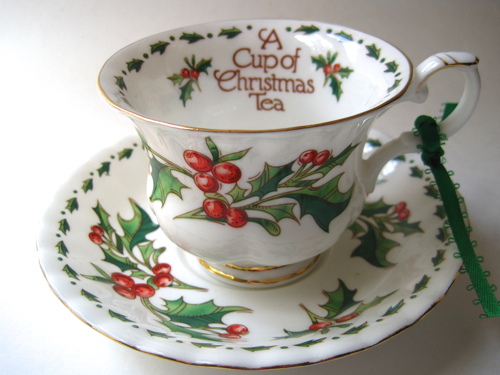 I wasn’t surprised to open the box and see a cool teacup and saucer inside. 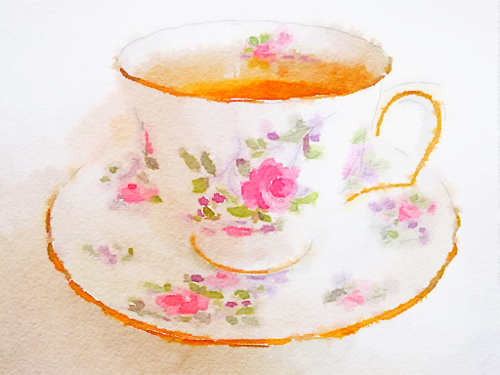 Lavender was my favorite color, and the teacup had pink and lavender flowers on it. My mom was a big tea drinker, so I got one of her tea bags and made a cup of Darjeeling to go with my pizza. Stupid old Brianna Simpson probably didn’t even know how to hold a teacup. And if she ever asked me about it, I was definitely going to tell her how important it was to always hold her pinkie up. Always. Ha! A couple of weeks ago, I wrote about watching an episode of the C-SPAN series on the First Ladies in which I learned about the controversial china selected by Lucy Hayes, wife of President Rutherford B. Hayes. My friend Joanie commented that she happened to catch the episode about Caroline Harrison, wife of President Benjamin Harrison. Mrs. Harrison was herself an accomplished china painter and is credited with making sure the existing china at the White House was cataloged. 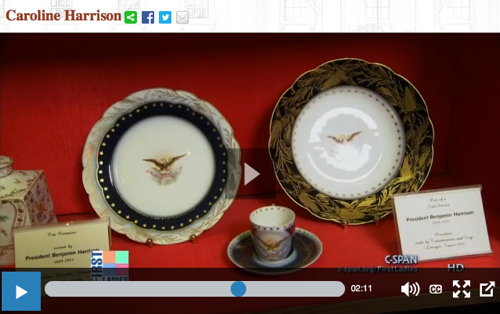 I looked up a video clip from the show on the C-SPAN website and learned even more about Mrs. Harrison and her china. According to the program, when Mrs. Harrison arrived at the White House, she was interested in "how the place worked," and on a visit to the ground floor, then considered the basement, she found the conditions dirty and dilapidated and aimed to spruce things up. She found some old pieces of china, asked servants how old those pieces were, and started trying to catalog the china. As a result, she is considered the First Lady whose idea it was to create a permanent china collection at the White House. Mrs. Harrison was interested in designing some china for the White House herself, and though she wanted it to be American, she discovered the country did not have a strong porcelain manufacturer at that time. Instead, she opted to have a French company provide the "blanks," and she provided the design. The shape of her plates is said to be Lincoln-era, and the eagle design on the plates was similar to what was on the Lincoln china. Mrs. Harrison designed a border of goldenrod and ears of corn for these wares, as her husband thought those two plants most representative of America. Mrs. Harrison painted the design and did samples so the china could be manufactured. Dinner plates, soup plates, and breakfast plates were made with a blue border, and breakfast plates and tea plates were made with a white border. Demitasse cups and saucers were part of the service as well. • She was the first First Lady to have a Christmas tree in the White House. • She helped raise funds for Johns Hopkins University medical school with the understanding it would admit women. • She was the first President General of the National Society of the Daughters of the American Revolution (I thought my DAR friend Linda would love that they included that). If you would like to see a brief video about the Harrison china for yourself, click here and you'll see the videos listed in a column on the right. 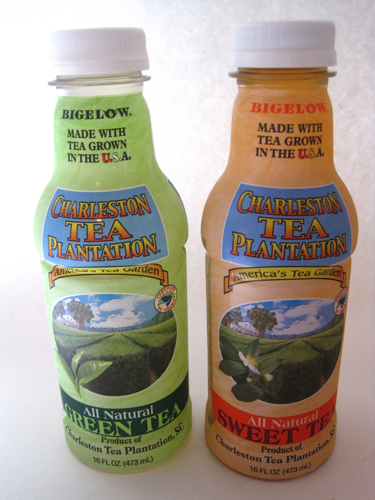 I was so impressed with those Charleston Tea Plantation bottled teas I found at Ingles recently, I went back and got two more flavors, the Green Tea and Sweet Tea varieties. The Green Tea tasted great, lightly sweet—and I never sweeten green tea—but still with a distinctive green tea taste. 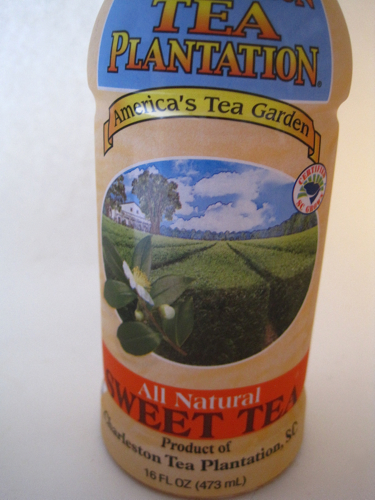 The Sweet Tea had a brisk but not astringent black tea taste and was pleasantly sweet. Not too much sweetness and not too little either. Both these teas are sweetened with cane sugar and have 60 calories (and 14 grams of sugar) per eight-ounce serving. 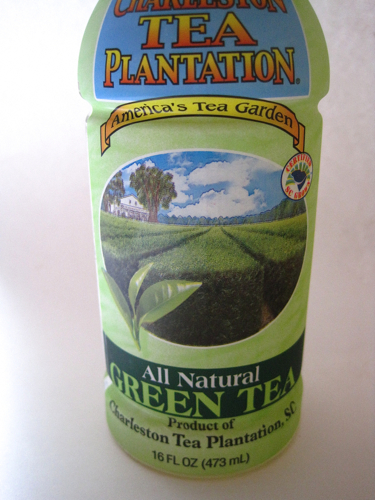 I did indeed get two servings out of each bottle, so I think these teas are perfect as an occasional treat, and I'm so happy to find products from the Charleston Tea Plantation on a local grocery store shelf! So my Aunt Jane and I were at the Salvation Army thrift store in nearby Carrollton last weekend when I spotted what I thought was a lidless teapot on the back of a shelf of housewares. 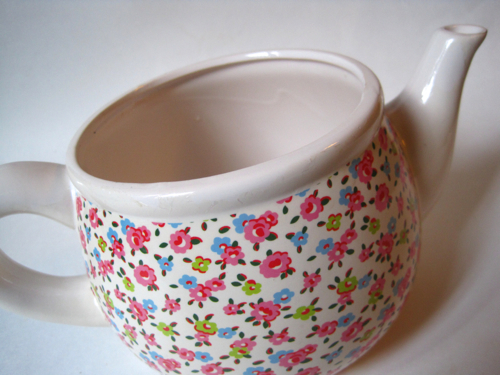 The color palette kind of reminded me of Cath Kidston, so I reached for it to see if I could determine the maker. When I pulled it forward, I was surprised to realize that although this unmarked piece was the size of an average teapot, it wasn’t a lidless teapot after all but instead had such a wide opening that this was probably supposed to be a planter. 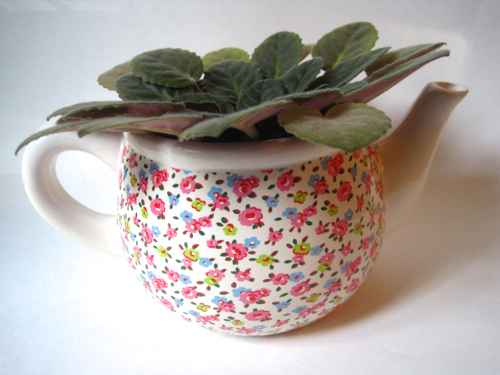 I’ve seen large teapot planters and small teapot planters, but it occurred to me I’ve not seen one the size of an actual teapot. And for the happy price of $1.80, I decided this one needed to come home with me! 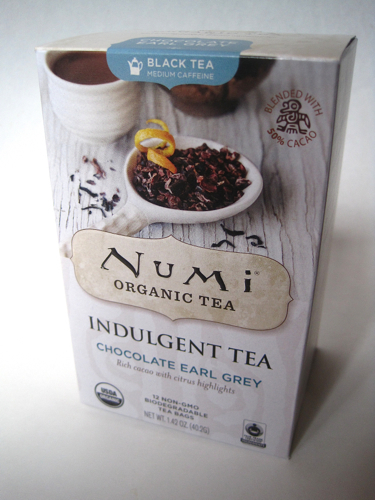 During a trip to World Market recently, I came across a new flavor of Numi tea that piqued my curiosity, this Chocolate Earl Grey Indulgent Tea. 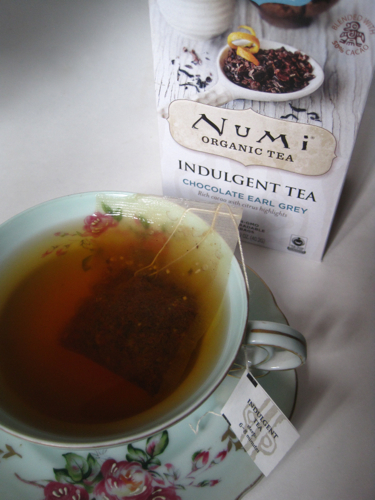 I wasn't quite sure whether chocolate Earl Grey was a good idea or not, but I knew I had to try it. The tea bags are individually wrapped in nice big envelopes, and I thought these look like "special" tea bags worthy of being tucked in a card or letter to a friend. When I first opened the tea bags, I realized these tea bags are made with a string somewhat like some tea bags I came across in London last year. When the tea bag steeps and has absorbed water, you just hold the tag and the string comes out as the weight of the tea bag pulls it down. So that was kind of fun to discover. 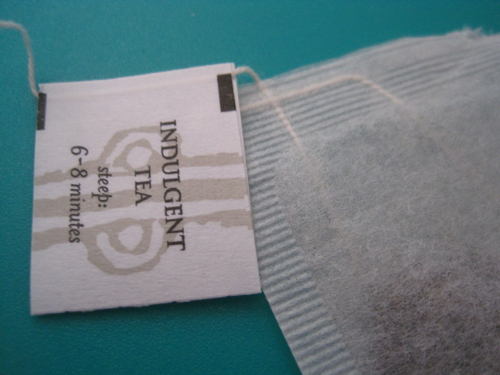 Unfortunately, the tea itself is not at all what I'd consider indulgent. The instructions said to steep the tea for 6-8 minutes, and I did, but I still ended up with what tasted like stale Earl Grey tea with only the slightest scent (no taste) of chocolate, so I'm not a fan. 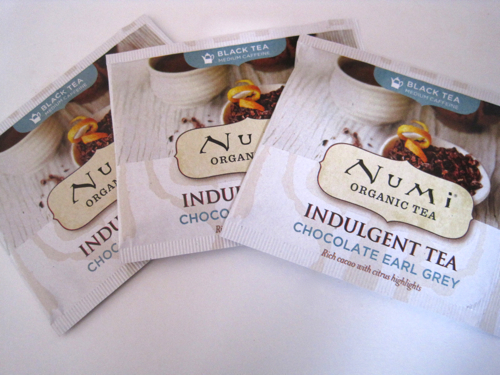 (I'm also embarrassed that I sent one of these tea bags to a friend before I tried it. I should know better!) 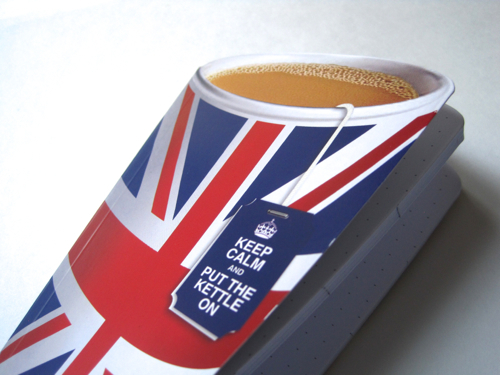 And I so wanted to like this tea! To my delight, Liz actually remembered to send me cell phone photos from the tea, and she said I could share them on my blog so I am! I must say this is the most fun tea party I've never attended! Above are Liz's mom, Shannon, and Liz's niece and Shannon's granddaughter, Hannah, who is one of the neatest kids I've ever met. I've heard enough Hannah stories over the years to know she's really a miniature adult, and oh, I love me some Hannah! Liz said she was such a hit at the Twilight Tea and was very good with the residents. Liz said she noticed Hannah would put her hand gently on someone's back and say, "Those are delicious lemon bars, aren't they? Would you like another?" So Hannah is quite the rock star now at the retirement home. Now Liz asked how many tea and toast sets I had, and I told her around 40. She said only 15-20 women would be coming, if that many, so send no more than 20. I knew I had a tote bag and picnic basket that were both packed with tea and toast sets in a moss rose design, and since there were 22 of those, that's what I sent. When I saw them all lined up here, I must say it made me so happy! Apparently, once word of the Twilight Tea spread, the number of attendees started soaring. 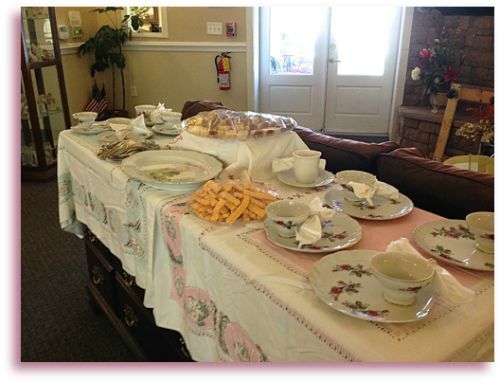 Those 15-20 women turned into 36 men and women, but fortunately the retirement home itself had a nice set of china they pulled into service for the tea, so pretty much the women got the tea and toast sets and the men got china, as I understand it. Liz said their menu (ordered from a local bakery) included lemon bars, magic bars, brownies, and cheese straws, and at the last minute they added crackers with cream cheese. I believe Liz served a berry blend tea. The other fun thing was that her mom, Shannon, read a couple of her poems, and they were such a hit that her daughters were sent scrambling to her room in search of more for the audience to hear. And at the end of the day, Shannon said it was the best day she'd had since moving to the retirement home. And that, my friends, is why I'm more than happy to loan out my teawares if my friends want to borrow them! People never know precisely where and when I’ll show up, and I work hard at keeping it that way. Sometimes I’m impulsive and make my first visit in July, but then again, I’m just as likely to show up in the dog days of August, or even early September, teasing my admirers with the promise of what will soon be there to stay. I’m a seasonal visitor to most places around the world, and I can only say that—and I hope this doesn’t sound too prideful—there are very few people who don’t eagerly await my arrival. It’s certainly nice to be loved, and why shouldn’t I be? I bring word that so many wonderful things are on the way. The wonderful things don’t appear on the exact day I arrive—for my visit is always just a fleeting one—but they do arrive not long afterward. Hayrides and apple festivals. College football games. Elementary school bake sales. Halloween and Thanksgiving. Late nights of stargazing around the fire pit. The atmosphere not only feels different once I’ve made my visit, it even smells different. 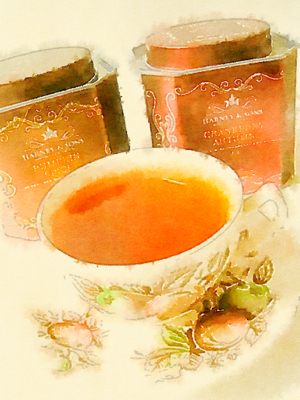 Soon, like clockwork, everyone’s having Cranberry Autumn tea—a personal favorite—and hot apple cider. Bakers start turning out plump loaves of pumpkin bread and their best pecan pies. Barbecue smoke wafts over the backyard fence just in time to signal a last-minute invite luring the neighbors to supper. And, oh, the caramel popcorn and cotton candy at the county fair. That rich, delicious hot sugar smell alone is a feast for the senses. And those things can’t be found in January, April, or June. Only after I show up. What I absolutely adore is that shortly after my arrival, everyone begins to chill out—literally and figuratively. Cooler temperatures move in, and so does a more relaxed, less frenzied pace. Whatever a man or woman’s leisure pursuit, they enjoy it more once I’ve worked my magic. Gardeners, suddenly shed of summer’s heat, head back outside to play in the dirt again. Fishermen and fisherwomen know that lakes will be low but spirits high since the bass will be coming out of their summer slump. And I admit I have a soft spot for quilters. Yes, I know they ply their needles year-round, but after I give the go-ahead, they seem to go into overdrive. Inspired by the brilliant coloring of the trees, the quilters gather their honeyed golds, flaming reds, bright browns and opulent oranges in an effort to mimick what’s going on in nature outside their homes. Soon, they’ll be at their sewing machines and wooden embroidery hoops, diligently working on quilts in the Log Cabin, Baltimore Album, or Wedding Ring pattern. Perhaps even a few Maple Leaf quilts will come to life in their hands. I hear about their creations every single year, and every single year, I love to give the quilters—and the gardeners, and the fishermen and fisherwomen—encouragement to indulge in the leisure pursuits that bring them so much pleasure. Knowing how important a role I play, I do give a great deal of thought to the time of my arrival. It can’t be so soon that my message seems ridiculous, and it can’t be so late that they don’t have a few weeks’ fun of looking forward. The timing of my visit is critical, whether they realize it or not. Also, there’s the fact that I don’t—can’t, really—choose to show up everywhere on the same day. That would be tiring. Plus, even I can’t be in two different places at one time, even though some people mistakenly think I can. Then there are those who disregard my existence entirely and stubbornly insist on consulting their calendar to determine when I’ll show up. As if a piece of paper—or today, some silly electronic device—could possibly predict when I’ll be there. I still get a kick out of the folly of using a manmade tool to predict something so magical. So, I am often asked, where did you come from? People are forever intrigued by the mystery surrounding me. I was born thousands of years ago, created in a whoosh and a whirl. There’s not an easy way to explain it, but for those who ask, I simply say that my mother was the wind and my father was the air. That usually does the trick without revealing too much of my mystique. While I can’t be contained within the pages of a calendar, I can be found, and found easily, by those whose senses have been trained to find me. They see me in the flutter of the first fallen leaf, and they feel me in that quiet moment when the last of summer’s heat pauses, for just a single second, to permit a slight, oh-so-slight breeze. And then I politely disappear for just a little longer, because I am, of course, the whisper of fall. Free tea samples available from Chi Whole Leaf! A peek into the potteries!